The process of reviewing your rough draft and making changes to organization and development that move it closer to a final draft. A process that checks for readability, logic, and clarity. A process that includes evaluating, adding, deleting, replacing, and moving items in your paper. A process that helps you see your paper as readers do. 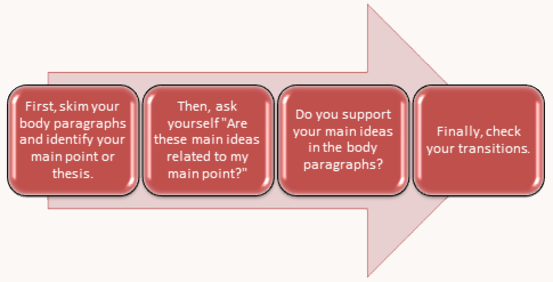 What steps should I take to revise my paper? Wait at least an hour after writing your paper before you begin revising it. Wait even longer, up to a day or two, if you can. Think BIG. At this stage, do not worry about minor errors. Focus on the overall organization and flow of your paper. As you read, keep asking yourself, “Will this make sense to readers? What does this say (is it clear? ), and what does it do (to help readers follow it)?" If you have a thesis statement, identify it. Ask yourself, “Does my thesis and the sentences that follow it tell my readers what my paper is about (topic), how I will talk about this topic (focus), and why I am writing about it (purpose)?” If you are having trouble developing your thesis statement, check out determining a thesis. Check your overall tone: is your tone appropriate for the assignment? In general, avoid sounding too formal and stuffy on the one hand, and too casual on the other. Eliminate most contractions and instead write out the complete phrase. Make sure that your paper is balanced. Each main point should be given about the same amount of space on the page. Does the conclusion of the paper tie your ideas together? Try to make your last sentence a poignant one. Remember, revision is a process. It may take some time to get used to reading and evaluating your own writing. If you find you have a difficult time revising a paper, speak to Writing Center tutor about it. We can help guide you through the revision process. The IUP Writing Center is located in 218 Eicher Hall and is free to all IUP students.